Since the Arlington Camp on August 20-23 sold out in 5 days, we decided we HAD to plan another the following weekend! This is an elite level swim camp to be held over three days! Your clinicians for this clinic will be Olympic gold medalist Nick Thoman and Olympic coach and the age group coach of several Olympians and Nationally Ranked swimmers Todd Schmitz. Sign up for one, two, or all THREE of the four hour sessions! Take advantage of early bird pricing – Sign up before prices rise! 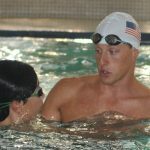 Nick and Coach Schmitz will lead 3 sessions for swimmers age 11 and older. Sessions will be limited to 36 participants. Sign up for 1, 2, or ALL 3 sessions. The start is your opportunity to cover as much ground as possible in a very short period of time, with great efficiency and momentum heading into your underwater kicking and breakout. There are countless intricacies to performing a start and you only get better with practice. Olympic gold medalist Nick Thoman will share his experience on how he found time to practice and improve his start both in and out of the water and Olympic Coach Todd Schmitz will teach you some of his most effective strategies to execute this explosive and athletic movement. FLAT STARTS: How you set up on the block including proper hand and foot placement can allow your swimmer to explode forward with a lot of explosive power. Nick and Coach Schmitz will work with each swimmer to find their best position on the block as well as how to launch their body forward into a tight streamline and enter through a small hole. BACKSTROKE STARTS: Getting into the right ready position with a straight back, hips high on the surface of the water, and feet positioned to get maximum power is extremely important to being able to execute a fast and clean backstroke start. Nick and Coach Schmitz will work with swimmers at this session to achieve a beautiful back arch over the water so that they can have an advantage in every backstroke race! UNDERWATER DOLPHIN KICKING: The not-so-secret weapon of elite level swimmers is their underwater dolphin kick. Nick Thoman is known as one of the best underwater dolphin kickers in the world and he specializes in teaching swimmers how to unlock their potential in this important skill. Freestyle and backstroke can be challenging for swimmers of all ages and abilities to take to the next level because of the complexity of the technique in both of these strokes! 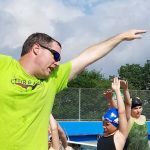 Your swimmer will learn drills and skills to be able to understand and apply techniques to race faster in both free and back as well as how to accelerate through every flip turn with Nick Thoman and Coach Schmitz. FREESTYLE: Participants will learn how to hold a straight and solid body line so that they can cut through the water with less drag. Practice keeping a still and low head position (especially during the breath!) while driving a strong flutter kick. Nick and Coach Schmitz will also teach participants how to get an early and powerful press backwards on the water in the arm pull to get more out of every stroke. From the 50 to the mile, your swimmer will learn skills that will allow them to drop time in every freestyle race. BACKSTROKE: Engaging your core not only allows you to swim stronger, but it also allows you to hold the proper body position. Olympic gold medalist Nick and Olympic Coach Todd Schmitz will help swimmers learn the importance of rotation and how to use it to their advantage for more power in each stroke. The arm pull in backstroke should press the water all the way through using the whole arm to achieve maximum propulsion. Backstrokers are often the fastest kickers on their teams, find out why and learn to have a stronger kick! FLIP TURNS: Your swimmer will learn how to carry their momentum through the turn to get in and out of every wall faster. Swimmers will practice accelerating into the wall with long strokes and then using their core and arms to get through the turn. They'll practice planting their feet on the wall for a powerful pushoff in the perfect streamline. Nick and Coach Schmitz will give the swimmers drills and exercises to help them master this athletic skill now as well as in the future! The short axis strokes are butterfly and breaststroke! These are very similar and challenging strokes to master due to the importance of rhythm! Participants at this session will learn not only how to have a stronger pull and kick, but also WHEN each movement should happen so that they can swim more connected and with more efficiency! Participants will also learn how to improve their open turns with Nick Thoman and Coach Schmitz! BUTTERFLY: Perfect the complexities of balancing power and fluid rhythm in one of the most dynamic athletic movements. Elite butterfliers maintain forward momentum by setting an immediate high catch with a perfectly timed kick. They are committed to a breathing pattern, perfecting their distance per stroke, and maintaining a horizontal body position - Nick and Coach Schmitz will help your swimmer become committed to these same skills to make them their habits every time they swim fly! OPEN TURNS:: Think about the open turn differently! You should not be making an open to turn around and swim the next lap. If you're doing this - you're actually stopping and then trying to regain speed again. An expertly executed open turn involves spinning backwards. This enables you to carry momentum into the pushoff. We're going to teach you how to cut a lot of time on this turn... helping you in all of your breaststroke and butterfly races! Swimmers and parents are invited to ask Nick and Coach Schmitz questions during a Q&A session. Gain insight into his training regimen, diet and nutrition, and recovery tactics. Remember to bring a snack because each session is FOUR HOURS LONG!